The HP LaserJet 4100 series is the speedier successor to the very robust HP LaserJet 4050. Reliable for personal use or small workgroups. Standard model includes 16MB RAM and one 500-sheet tray. Upgrade options include features like network cards, duplexers, and extra trays. 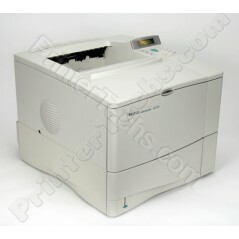 Other models in this series include HP LaserJet 4100N , HP LaserJet 4100TN , HP LaserJet 4100DTN. HP part number is C8049A. The LaserJet 4100 is the successor to the very robust HP LaserJet 4050. The two printers look very similar however the LaserJet 4100 features many improvements. The 4100 formatter board has significantly faster processing and page output speed (25 pages per minute compared to 16 pages per minute). This is a wonderful printer for personal use or small workgroups. Upgrade options include HP JetDirect network cards, duplexers, and extra trays are also available.